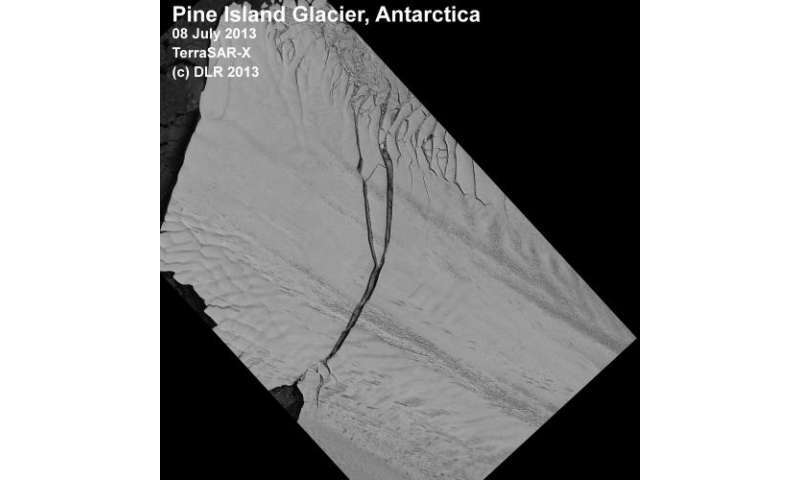 On 8 July 2013 a huge area of the ice shelf broke away from the Pine Island glacier, the longest and fastest flowing glacier in the Antarctic, and is now floating in the Amundsen Sea in the form of a very large iceberg. Scientists of the Alfred Wegener Institute - Helmholtz Centre for Polar and Marine Research have been following this natural spectacle via the earth observation satellites TerraSAR-X from the German Space Agency (DLR) and have documented it in many individual images. The data is intended to help solve the physical puzzle of this "calving". 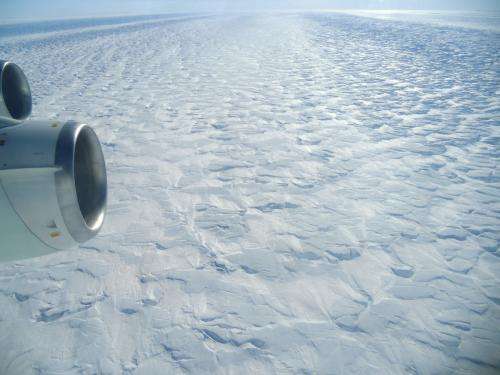 Scientists from the American space agency NASA discovered the first crack in the glacier tongue on 14 October 2011 when flying over the area. At that time it was some 24 kilometres long and 50 metres wide. "As a result of these cracks, one giant iceberg broke away from the glacier tongue. It measures 720 square kilometres and is therefore almost as large as the city of Hamburg", reports Professor Dr Angelika Humbert, ice researcher at the Alfred Wegener Institute. The glaciologist and her team used the high resolution radar images of the DLR earth observation satellite TerraSAR-X to observe the progress of the two cracks and to better understand the physical processes behind the glacier movements. The researchers were thus able to measure the widths of the gaps and calculate the flow speed of the ice. "Above the large crack, the glacier last flowed at a speed of twelve metres per day", reports Humbert's colleague Dr Dana Floricioiu from DLR. And Nina Wilkens, PhD graduate in Professor Humbert's team, adds: "Using the images we have been able to follow how the larger crack on the Pine Island glacier extended initially to a length of 28 kilometres. Shortly before the "birth" of the iceberg, the gap then widened bit by bit so that it measured around 540 metres at its widest point." The scientists incorporate these and other TerraSAR-X satellite data in computer simulations using which they are able to model the break and flow mechanisms of the ice masses. "Glaciers are constantly in motion. They have their very own flow dynamics. Their ice is exposed to permanent tensions and the calving of icebergs is still largely unresearched ", explains ice modeller Angelika Humbert. The scientist and her team then compare their simulation results with current satellite data such as from TerraSAR-X. If the model agrees with reality, the scientists can conclude, for example, the gliding property of the ground beneath the glacier ice and how the ice flow could behave in the event of further global warming. Are ice breaks caused by climate change? Angelika Humbert does not so far see any direct connection: "The creation of cracks in the shelf ice and the development of new icebergs are natural processes", says the glaciologist. However, the Pine Island glacier, which flows from the Hudson mountains to the Amundsen Sea, was the fastest flowing glacier in the Western Antarctic with a flow speed of around 4 kilometres per year. This speed is less caused by the rising air temperatures, however, and is more attributable to the fact that the wind directions in the Amundsen Sea have altered. "The wind now brings warm sea water beneath the shelf ice. Over time, this process means that the shelf ice melts from below, primarily at the so-called grounding line, the critical transition to the land ice", says the scientist. For the Western Antarctic ice shelf, an even faster flow of the Pine Island glacier would presumably have serious consequences. "The Western Antarctic land ice is on land which is deeper than sea level. Its "bed" tends towards the land. The danger therefore exists that these large ice masses will become unstable and will start to slide", says Angelika Humbert. If the entire West Antarctic ice shield were to flow into the Ocean, this would lead to a global rise in sea level of around 3.3 metres. The shelf ice, which is 200 to 1200 metres, thick is created by glaciers sliding into the sea. It is therefore an extension of the Antarctic land ice which thins at the edges and floats on the sea. The ice shelf itself rests on the Antarctic continent, reaching a thickness of up to four kilometres and is largely frozen to the rock bottom. A special feature of the Western Antarctic is that large areas of land are below sea level. Impossible. The world is getting colder according to Global Warming Denialists. These observations must be fake. Wow, your epic stupidity is a scientific wonder. You should donate yourself to science, don't even wait to die. I thought the Antarctic was doing just fine antigoretard? The production of this huge ice berg is yet another Inconvenient Truth for the Anti-Gore-Tard. He is angry because the world just doesn't work the way his Conservative Ideology tells him it must. Are ice breaks caused by climate change? 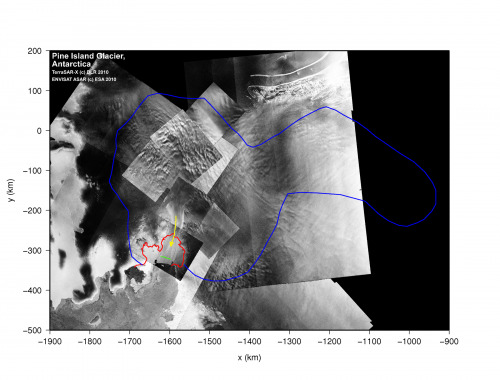 Angelika Humbert does not so far see any direct connection: "The creation of cracks in the shelf ice and the development of new icebergs are natural processes", says the glaciologist. Just when I think I've encountered the dumbest of your lot, up pops another one from the depths of your cesspool of ignorance. Are ice breaks caused by climate change? Angelika Humbert does not so far see any direct connection: "The creation of cracks in the shelf ice and the development of new icebergs are natural processes"
Only those that Believe in the Great Climate Change Religion headed by High Priest Al (aka maken money on AGW scammer) Gore. Iceberg sunk what famous ship...... oh yea I forgot, global warming caused the sinking of the titanic. According to Guidelines for posting comments on Phys.org articles which you just reminded me of you should Be Civil and not to use obscenities. Do you think calling someone like you did antigoracle a "tard" is civil? If so, I'm sure you reported yourself. As I find the term "tard" to be offensive due to the reference being to mentally handicapped people, I'm sure you reported yourself twice. If you haven't reported yourself, you are a progressive hypocrite. The stupid AGW Alarmist turds descended on this article the way flies descend on them, and without reading it, proceeded to post their ignoRANT. Hey turds, I'm waiting on your response. Turds. antigore...... I am not a AGW supporter, however you offend me when you call people turds....please stop especially if you are a conservative. Let the Progressives use vulgar language as it shows their true IQ. At least we don't have to worry about the denialists trotting around "more ice in the Antarctic" anymore. Oh they're dishonest shills you say? I guess we'll still be hearing about that non-evidence. Vulgarity has nothing to do with IQ. It's like you think you can be as much of a jerk to anyone you want and you're still a good person if you don't swear. It's ridiculous. You're the exact same type of person that thinks avoiding the n-word precludes him from being a racist. It doesn't. JohnGee the hypocrite. Vulgarity is used by those with too low of an IQ to think of anything better to say. Progressives generally love using vulgarities because they either really have low IQ's or want to pander to those with low IQ's. Often times they use vulgarities because they are bullies and want to intimidate, infuriate, or shout down people. When you use vulgarities, which of the proceeding includes you? As for calling me a racist again, that doesn't fly as I believe all people are created equal, and that people should be judged on their character. You by calling me a racist, indicate that you are actually a racist. Just like you using homosexuality as a slur towards me, indicates you suffer from homophobia. Vulgarity doesn't magically invalidate someone's point. You have demonstrated your racism, homophobia, and latent homosexuality for all to read. JohnGee, vulgarity doesn't prove a person has a POINT, it just means they don't have the vocabulary to make a point without using vulgarity. anyone who doesn't know how to lookup comments PM me and I'll let you know how. Then you can judge if JohnGee is a Progressive hypocrite or not. Also you can look up my comments and see if JohnGee is full of it, aka lying, or telling the truth. free_from_thinking has demonstrated his hypocrisy multiple times in this thread alone. That he is blind to such does not make it invisible to others. They're having a reunion at your alma mater, Turd University.